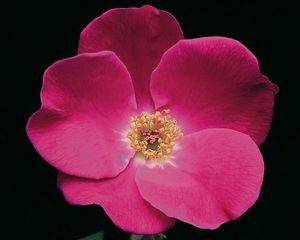 A sport of Home Run, Pink Home Run has all of the easy care qualities that many of us have come to love in roses. Great as a hedge or border. Use this wonderful rose for season long color. Rose-pink. None to mild fragrance. 5 petals. Average diameter 2.75″. Medium, single (4-8 petals), cluster-flowered, in small clusters bloom form. Continuous (perpetual) bloom throughout the season. Medium, bushy, compact, rounded. Medium, matte, dark green foliage. Height of 28″ to 35″ (70 to 90 cm).